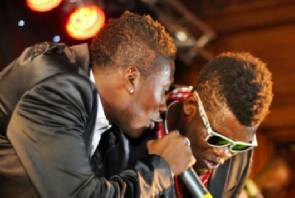 Hiplife show stopper Castro has jumped to the defense of Baby Jet Asamoah Gyan over claims by some Castro fans that Asamoah Gyan “destroyed” the part he sang on Castro’s latest release Odo Pa. Contrary to the claim that Asamoah Gyan’s portion on Odo Pa was not well executed, the African Girls hitmaker told Showbiz last week “Asamoah’s version is even the most loved part by most of my fans. Just visit the various social sites and you will know how people are crazy about his part. Some people even doubt if indeed it was he who sang that portion, but that is Asamoah for you, he is multi-talented”. He revealed to Showbiz that unknown to many, he had been friends with the skipper of the Black Stars since childhood and had always known that the latter loved good music. He denied that he was riding on the back of Asamoah’s popularity to direct some shine to himself in the face of the stiff competition on the music scene. “Asamoah is only doing what he loves to do”, he said. He confirmed, however, that his collaboration with Asamoah Gyan has helped his brand and music to transcend the borders of the country because he is the only artiste whose music is played on Super Sports, feat most artistes could only dream of. Before the release of Odo pa, Castro featured the Black Stars skipper on his African Girls album in 201l which revealed the showbiz spirit within him. Currently, working on his fifth album, the Back and Front singer believes Odo Pa, the new hit single from the yet to be released album is a testimony of the good stuff to expect. He hinted of the album’s release next year when Asamoah returns home after the league and promised there will be “fireworks”. The Toffee singer told Showbiz that his voice has always been that magical wand that pulls people to his music. “For me, my voice is my identity because at the initial stages of being in the public limelight, it was that which gave me recognition. “Till date, whenever I step out and ask for assistance from people, they blackmail me to sing for them. My voice gives me the power to excel. “You can’t even imagine that when I go to the hospital to seek medical assistance, the nurses will say ‘use that voice of yours to sing for us before we attend to you’ and in most cases, I am compelled to do it. I never knew that my voice has given me such an identity” he said. According to the artiste, his accolade” The Destroyer” which was attached to his showbiz name emerged from the fact that all the songs he comes out with become instant hits because he is versatile and cannot be clamp down by just one genre of music. “I don’t just do any music but normally seek the views of my fans who tell me what they want and I give them just exactly that. His debut album, Sradinam shot him into instant fame and he followed up with subsequent hit albums including Toffee, Comm Centre and African Girls. “It has always been my prayer that God will bless me so that I can help the society, family and unearth talents that are hidden. My dream is to help bring talented but hidden young artistes to limelight. “There are so many talents but because the music industry lacks the right structures like producers and record labels, many of these talents are left to go waste”. May God bless you, Castro!